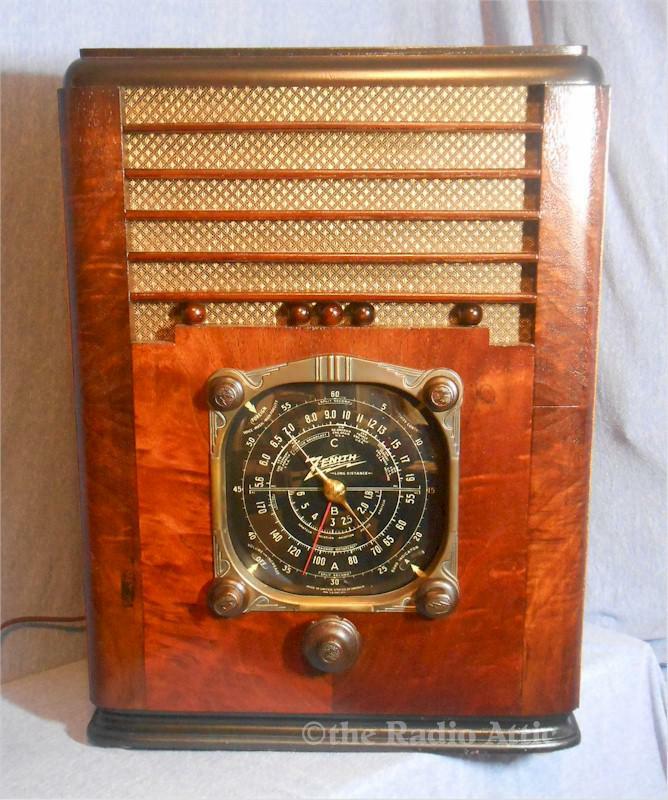 This absolutely stunning six-tube large Broadcast/ShortWave radio will be a highlight of any vintage radio collection. It retains the original (rare and perfect) speaker, wooden knobs, bezel, dial glass and dial scale, all in beautiful condition. New AC line cord was installed. The cabinet was beautifully restored with lacquer and is in smooth semi-gloss condition as original. Grille cloth is a correct reproduction. A thorough restoration of the electronics was performed: replacing all electrolytic (filter) caps, all wax/paper caps, replacement of all out of tolerance resistors and tubes, complete alignment (stations appear on dial in correct place). As a result, it receives stations across all bands. Chassis pics showing work done are available, just ask. Short wire antenna is needed (supplied). Aux input (iPod, phone, CD player, etc) has been added. 90 day warranty. 22-1/2"H x 17"W x 12"D.